Over the last eight years, volatility and low interest rates have proven the importance of active diversification and asset allocation. Even in the face of less-than-ideal investment conditions, managed solutions have delivered greater stability and lower volatility. Diversifying can reduce the risks associated with holding only one type of investment opportunity – whether it be home country bias, asset class or market capitalization preferences – and has been shown to favourably contribute to return potential. Source: AGF Investment Operations, December 31, 2016. 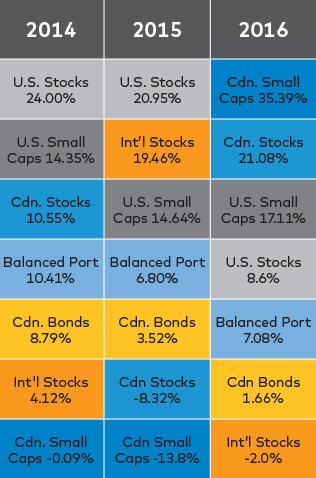 Canadian Stocks represented by S&P/TSX Composite Total Return Index, U.S. Stocks – S&P 500 Total Return Index (C$), International Stocks – MSCI EAFE Index (C$), Canadian Bonds – FTSE TMX Canada Universe Bond Index, U.S. Small Caps – Russell 2000 Index (C$), Canadian Small Caps – BMO Nesbitt Burns Canadian Small Cap Index. Balanced Portfolio made up of 20% Cdn. Stocks / 20% International Stocks / 15% U.S. Stocks / 40% Cdn. Bonds / 2.5% U.S. Small Caps / 2.5% Cdn. Small Caps.